Those orange antenna things aren’t actually antenna. Instead, that’s the caterpillar’s osmeterium: a specialized scent gland that swallowtail caterpillars can spring from their heads when they sense danger. It’s a pretty intimidating display. Oh yeah, I totally jumped when this guy unleashed his osmeterium. Supposedly, the osmeterium also release some noxious odor. Makes sense, since they are scent glands. But, well, I didn’t smell anything. Maybe I just didn’t get my nose close enough to smell that special angry caterpillar scent. I’m also not sure what’s going on with that bubble of spittle in the last photo. The caterpillar was decidely not happy with me. So, maybe this is its second line of defense? Perhaps that stuff tastes horrible. So bad that a hungry bird would drop the caterpillar. I don’t know. I’m the curious sort. But, not so curious that I’m going to taste bubbles of angry caterpillar spit. Sorry. 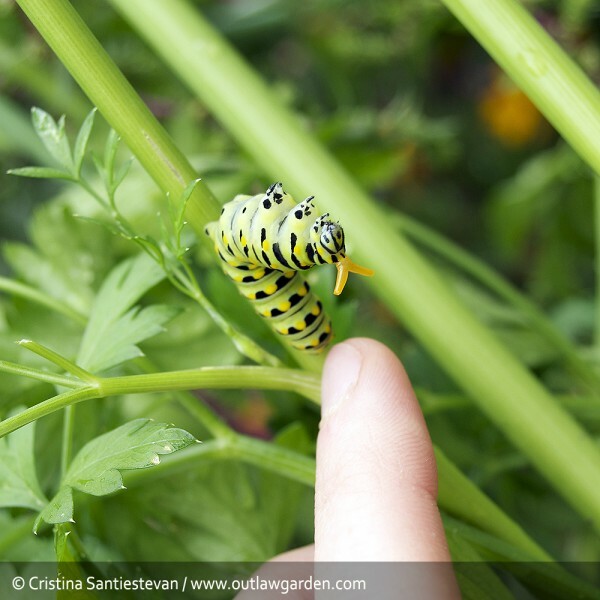 Do you have black swallowtail caterpillars in your garden? 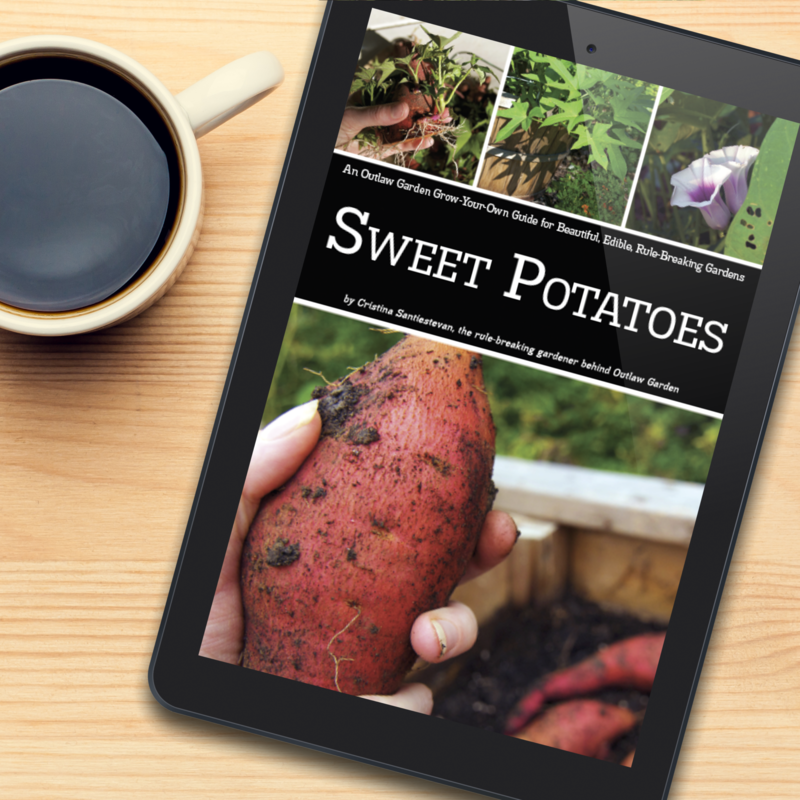 You might, if you have parsley, dill, carrots or other Apiaceae plants in your garden. I actually planted a bunch of all of these plants in the patch of common property/edge of the woods/big mess of “weeds” behind our property just so I could attract/feed some of these guys. I’ll be able to see if parsley can stand up to E. Texas’ high summer heat & humidity when we get back to start the garden again. I know that dill does fairly well. Are parsley seeds difficult to start? Any tips? Parsley seeds are very easy to start and I have a parsley plant that is now 2 years old. It lives through the winter it seems, at least the north Texas winter. I have now had three hatchings of parsley worms this spring and summer! Three generations of beautiful swallowtails. My big concern with them is that we have a spider that is taking them out. I witnessed this and it is very upsetting. I don’t care for parsley, but love the caterpillars. I go visit them several times a day just to see how big they have become. Mine appear to crawl off to become chrysalis’s as I have never seen one on the plant. I think you’re right, Terri. The caterpillars do crawl off to form their chrysalis. The monarchs did the same thing last year. You’re lucky to have three generations of parsley worms! I had just one this spring, even though I still have some of last year’s parsley standing in the garden. Must be a regional difference; I’m in Virginia. I wait until the caterpillars are big and have lots of green coloring. At this point I move them to my “net laundry hamper”, complete with a parsley plant and some nice branches. They soon form a chrysalis and days later emerge into the beautiful swallowtail. I love gently lifting them and then watching them fly away! 14 releases so far this summer and 5 more chrysalis! I just had my first caterpillars this year! They had eaten so much I thought a rabbit or deer had gotten into the garden. When I looked there were about 11 of the creatures. They were so cute I decided not to disturb them but wanted to find out if they were harmful pests. I am glad they are not. Next year I am going to try and see if I can get one of them a little defensive. I want to watch them in action. Thanks for the info. Yes, this is the first year I have seen multiple hatchlings. Last year we had one. I think they are just beautiful. What should I do if I would rather have my dill than the worms/butterflies?? I would plant multiple dill and enjoy the herb and the catepillars! 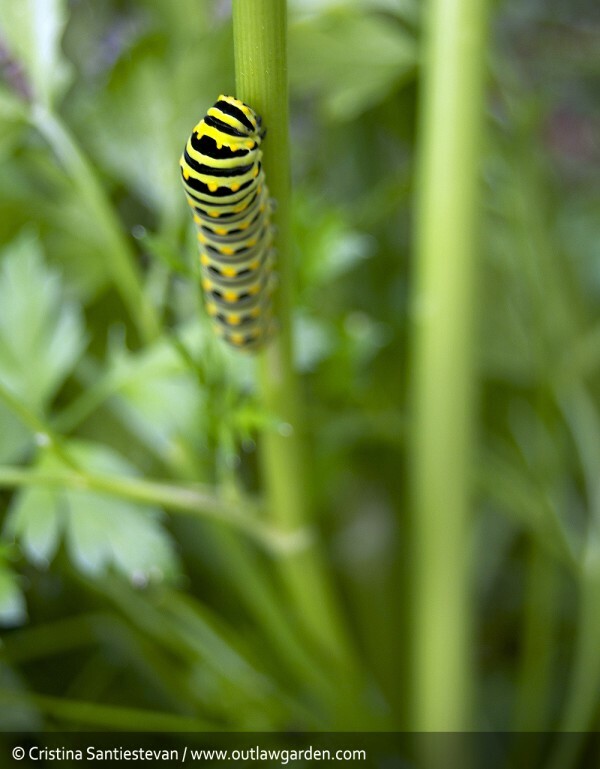 Well, you can always remove the caterpillars from the dill or parsley plants. Or… What I do is leave some parsley in the garden to overwinter. That following spring, the parsley (a biennial) will bloom. Those are the plants I let the caterpillars have. The rest — the newly planted parsley — is for me. Yes, you have to be careful as when they are really small they look like bird poop. I actually witnessed one crawl out of my garden and nestle himself into a gap in my fence. 2 days later he is a crysalis. Such a beautiful life-cycle. UGH! I wish I had checked the internet first *cries*. I started growing herbs in pots and found about six of them on my parsley this morning. I snipped the parsley leaves that the little caterpillars seemed to be sleeping on and tossed them over the fence. I had a similar thought as Virginia….”my parsley, mine!”. I’ll know better next time and plant two pots. One for me, one for the caterpillars. I’m not sure I’ll be brave enough to find out what an angry one looks like – instead I’ll wait to see the beautiful results! Thanks for your wonderful website and pictures! Where did the swallowtail caterpillars go!!!! I live on a second floor and had them on the parsley out on the balcony..there were three..non there are none..where did they go? Hi Rose — They probably flew off as butterflies! Caterpillars grow and transform much faster than seems possible. And, often, they crawl quite far from their food plant before pupating. So, you may never find their chrysalis. I suspect this is to foil predators. Thanks… I was a little bit upset when I discovered an out break of these “buggers” on my dill… And they are really reeking havoc on it, however, having butterflies is one of little pleasures in life so they have been granted immunity, thanks to your info… I looked at a few places to find the what this was so I appreciate the photos and info..
It’s entirely up to you, Angie. You can let the caterpillars have the plant (they are pretty). Or, you can relocate the caterpillars to another plant in the carrot / parsley family. Either way, the plant should recover once the caterpillars are done eating and growing. 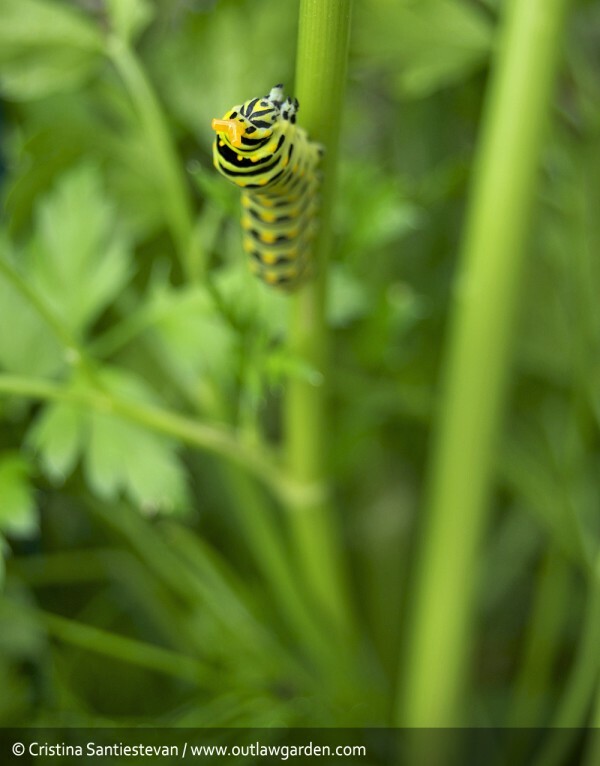 I planted parsley in a pot early in the summer for the sole purpose of attracting black swallowtail eggs/caterpillars. I’ve successfully “hatched” about 20 into butterflies by putting the caterpillars in a butterfly cage and feeding them parsley til they do their transition. We just came home from being gone two weeks; I had 4 caterpillars in various stages, happily munching on the potted parsley. I carefully moved them to the cage. HOWEVER, because my parsley hadn’t been watered, it was withering so I purchased some at the grocery. I didn’t think to get organic. Three of my 4 caterpillars died; the 4th doesn’t seem too healthy. Should I have purchased organic parsley?? Did I inadvertently kills the new caterpillars? Not sure, Jeannie, though that certainly seems possible. There’s no telling what sort of anti-caterpillar pesticides had been used on that parsley. Better luck next time! Thanks, Cristina. My one remaining caterpillar seems healthy and is just now getting ready to go into chrysalis (emoted that green slime on the bottom of the cage, climbs up on the side of the cage and begins going into the “coma” stage before shedding skin and becoming a chrysalis). It was the largest of the 4 that I had a week or so and the only one to survive. If it was some pesticide on the Kroger-bought parsley, it must have been old/strong enough to survive it. what happens when they go into “coma” stage? mine latched himself onto the side of the container on aug 4 and he’s turning brownish but no movement since aug 4. did he died? or is he ok? I’ve never had one before. I think it takes a day or so for them to go from the “comma” stage to a formed chrysalis. I have seen some caterpillars die at that stage, so I suppose that’s possible. I imagine it’s a risky step in a caterpillar’s life — lots of things happening at once! I go around every day & check my plants. Imagine my surprise when I found my parsley half gone! I have had parsley for 5 years now & this is the first time I have had the black swallowtail worm on it. Now that I know what they are I will plant more parsley next spring. Aren’t parsley worms adorable? I always try to overwinter some parsley, both for the flowers and seeds, and to provide more forage for parsley worms. They’ll eat just about anything in the parsley family, so you can also try planting extra dill or lovage. Enjoy! Last year they killed my parsley 🙁 This year I just tossed them off and my parsley is still growing. What I don’t get is where on earth do they come from overnight??? Anyone have an answer??? I have never seen them crawling about or get up my rock wall into the plants. It is so bizarre!! 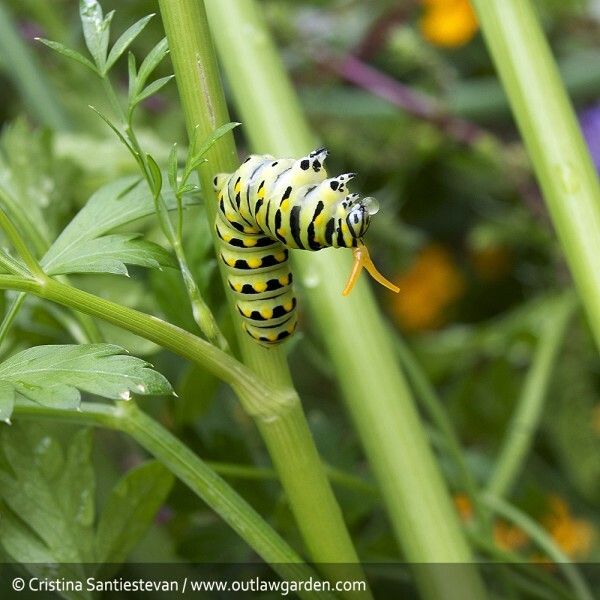 Parsley worms are the caterpillars of black swallowtail butterflies. The female butterflies lay their eggs on your plant, but the caterpillars are quite small when they first hatch. They’re easy to miss until they’ve gotten pretty large. If you want to have your parsley and your parsley worms too, you can either plant a few sacrifice parsley plants or transfer the caterpillars to any other parsley-family plant (fennel, parsley, dill, carrots…). Is it possible for these caterpillars to be found on orange trees? I have two baby orange trees that I planted in my backyard in Spring 2014. I went searching for pests this morning on one of them as I noticed a very large amount of leaves had been eaten. I did find what looked like bird poop on several leaves, but left it alone as I thought it really was poop! Lol! This was found on the top of the leaves, not the undersides which is where I thought caterpillars hung out. Then, on one of the branches, I found this 2 to 2 1/2 inch brownish-tanish sort of thing and touched it…as I was trying to figure out what it was. I about peed myself when one end reared back and two orange things came shooting out! I’m sorry to say that I did remove it and extinguished it. :/ Then, I went searching on the internet for what this could be. I did find a caterpillar called Orangedog that I thought was the culprit, but there was no mention of any orange horns/antennas. Continuing my search lead me to your site and the parsleyworm. I do have a pretty good size veggie and herb garden on the side of my house. I have both carrots and parsley, but haven’t found any large worms/caterpillars anywhere in my garden. Thank you in advance for any help you can give in helping me identify exactly what type of caterpillar I have devouring my poor little orange tree. Parsley worms are pretty choosey about their preferred plants — they stick with parsley, dill, lovage, and other plants in the parsley / carrot family. I doubt you’d find one on an orange tree. But, parsley worms are not the only caterpillars to use frightful displays as a defense against predators. Good luck tracking down the actual ID of that caterpillar! It’s another type of swallowtail larvae, the Orange dog is the common name. I just found out myself. No worries, Isela — If you continue to grow plants in the parsley family (carrots, parsley, fennel, parsnip, etc), you’ll get more caterpillars in the coming months and years. I did the same thing…killed 3 of them. I feel terrible as I love black Swallowtailed butterflies. I hope I have some more caterpillars and will take care of them. So very glad to read this website. Wish I had this info a few days ago. Now I can hope that she laid more eggs on my parsley and dill. I have a green carter pillars in my garden they are poison.? Because I found a death squirrel next to them. Nope. They definitely wouldn’t kill a squirrel. Just bad tasting. Oh gosh, this is an old question (my fault, sorry! ), AND, I have no idea of the answer. I wonder if he wasn’t eating because he was about to pupate? Did he suddenly disappear? Caterpillars often leave their host plant before forming their chrysalis. Haha, I let my granddaughter and daughter investigate the tiger swallowtail caterpillar on my magnolia, told them it was safe but that it would pop out it’s osmeteria if they tried to pick it up. They messed with it for a minute, making it rear up and so forth, then as I walked away I noticed the smell- then they did, then my 5 year old granddaughter said, it smells like oranges . . . and poop! I think he may actually have been attacked by a wasp or something. I’ve heard before that wasps will lay their eggs in parsley worms. I am relieved to learn about these creatures that are all over my dill plant. Can I still eat the dill from that plant if a branch is clear of worms??? I have some fennel in my central TX garden that is thriving and multiplying with zero attention. It is the only plant that overwintered from my insectary mix. Anyway, these “stinky horn caterpillars” as I call them really love the fennel. I have picked them off twice with some uncertainty as to whether I really need to save the fennel from them, and I can definitely smell their attack horn smell. It is a sickly sweet smell. I also attempted to feed one to my rooster, who pecked once and then got the heck away from it. Anyway, thank you for teaching me that this fascinating creature becomes a swallowtail butterfly! Had a pot full of parsley caterpillars in all sizes , was watching them daily grow and eat my parsley. as the parsley got more sparse, I could really see all the different sizes. one night last week we had an awful rain storm(very heavy rain). next morning I ran outside to check plant and ALL caterpillars were gone ! I mean no trace of them not even the little black ones. Where did they go that fast and in that rain? just crazy. I checked other plants, fences etc, so strange, Ant ideas? Baffled. Not sure, Diane. The mature caterpillars do move to other plants when they are ready to form their chrysalis. So maybe that’s what happened? Hopefully the didn’t wash away in the rain! But WHICH plant would the caterpillars go to for forming the chrysalis? I have a FAT TOAD that is monitoring my parsley pot and has eaten at least three smaller caterpillars. That pot spent the night on my patio table and all is well, so far. Where can I “hide” the caterpillars? The toad even came up onto my patio!! The only other vegetation in my lawn is a crepe myrtle, small fig tree, lantana, and bouganvilla. The toads hide in the straw mulch. Any suggestions as to which plant might be better for a chrysalis to” hang out?” Nature is stressing me out! Ha Do LOVE butterflies! Oh, sorry I missed this, Pat. And sorry to hear the wild critters are stressing you out! Those toads are good to have around (they eat slugs, for starters). Your caterpillars could have gone just about anywhere. I’ve had them literally crawl across my hot, full-sun, asphalt driveway. I’ve found then hanging on the side of my house. Several used a tomato trellis one year. Pretty much anything they can climb up and dangle from will do the trick. I found three of these little guys in my parsley (8/1) plant then the following day (8/2) i found 1 so I took the little guy and put him on a container with fresh parsley and the other morning (8/3) he was eating up a storm and popping like a champ. So then i noticed he looked like he was wondering around his container and there were times when i would put his container outside for fresh air open slightly then bring it in at night cause it’s warmer here now. So yesterday (8/4) I noticed he attached himself to the side of his container with a thread from his middle section and when I petted him his antenna came out. He was brighter in color yesterday and today looks like he has a duller look to him looks like he has brownish tinge to him and he’s not moving. Is he ok? I hope he hasn’t died. He might be able to form his chrysalis. They go awfully still for a while before the transformation. I hope it all worked out ok! I live in Eastern Pennsylvania and brought in my four parsley caterpillars last night because of the frost predicted. They are in a container with loads of parsley and two of them are moving so fast unlike just sitting on the parsley outside. They are the same size as your picture and one did give me the angry attitude. I do not want them to die. WHAT SHOULD I DO? Sorry I missed this until now, Mimi. Sounds like your caterpillars were about ready to form their chrysalises, though October sure is late for that (I’ve noticed that butterfly pretty much keep laying eggs all summer long, so some caterpillars inevitably mature too late). I hope they made it, but don’t stress if they didn’t — you’re sure to have more if you plant parsley and/or its relatives again this year! I found 28 parsley worms (some fairly plump) on my few plants, almost totally eaten. I picked them off and placed in a container to try to save the worms. I really wanted to save what parsley I had left. I don’t have extra parsley plants to feed the worms, nor do I have dill or carrots. Will the worms eat anything else, like rosemary (I have plenty of)? Goodness, I’m late with my reply here. Too late to be of help with your parsley worms, but perhaps for someone else… The answer is that they really only feed on plants in the parsley / carrot family. That’s parsley, carrot, dill, parsnips, and fennel, as well as wild relatives such as Queen Anne’s lace. They won’t eat unrelated plants, such as rosemary. Thanks for the detailed information! Our curly parsley caterpillar just did this to us and we were amazed! Interestingly, our smaller caterpillar didn’t do it (yet). We went right to the internet to research and found you! Thanks so much for teaching us more about it! Hi, I have about 20 parsley worms right now, ( including the chrysalis) and me and my friends were holding them. After they had been crawling on my hands and I put them back on the parsley. A little while after I had handled them, my finger bagan to tingle, almost like the sensation you get when your leg or arm falls asleep. I searched the web for what might have happened; but as far as I can tell, parsley worms don’t leave barbs, toxins, or anything of the the sort. Have you experienced this; or possibly heard of it happening? If so; please let me know. Thanks!